How do you remember Jewish lives when nothing remains? Małgosia and Anka at the Jewish cemetery. The building in the background holds trash bins for surrounding apartments. The resident we spoke with felt uncomfortable about keeping the trash in a cemetery. Author Marysia Galbraith has kindly let the Bama Anthro Blog Network repost from the original site here. In early December, I visited the Poznan Jewish Cemetery for a second time with Anna Weronika Brzezińska, a professor at the Institute of Ethnology and Cultural Anthropology at Adam Mickiewicz University, and Małgosia Wosińska, a doctoral student at the same institute. We chose the coldest day of the season for our tour of sites associated with Jewish culture. Still, it was great to get the perspective of other ethnographers on some of the places where Jewish heritage is marked and unmarked in Poznan. The gate into the courtyard was locked as usual, so Anka pushed the buttons on the intercom until a resident answered and buzzed us in. Anka shared her knowledge of the history of the cemetery (see some of this in my previous post). On a copy of a map from 1900, she pointed out how large the Jewish cemetery was, and how it abutted two large Catholic cemeteries. All were established in what at the time was the outskirts of the city to make room for development of the city center. Commemorative graves and old tombstones recovered around the city. The apartments overlooking the site were built just outside the cemetery walls in the early 20th century. Poznan continued to expand so that by the early 20th century, there was another initiative to reclaim these cemeteries for other purposes. First, buildings were built along the roads, including the apartments on Śniadecki Street (visible on the other side of the wall behind the tombstones) and the Poznan Trade Center (Targi Poznańskie) on Głogowska and Grunwaldzka Streets. During World War II, the Jewish tombstones were removed and repurposed for roadways, sidewalks, and other building projects. The Catholic cemeteries (which already seem to have been at least partially missing in the 1927 photo) were also damaged, though they were not the object of systematic wartime destruction as was the Jewish cemetery. After World War II, in the 1950s, the socialist government liquidated what remained of all of the cemeteries in this area. This served a dual purpose for the secular socialist regime—so the land could be developed, but also because the cemeteries were affiliated with religions. It changes things to realize it was not just the Jewish cemetery that was redeveloped, but also Catholic ones. 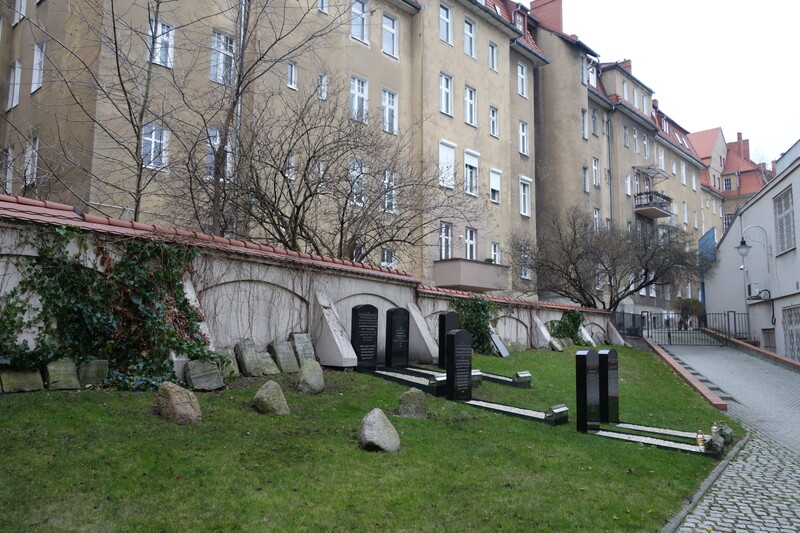 Later, when we passed a park across from the train station, Anka said it used to be yet another Catholic cemetery. Taken together, they indicate a general attitude about the past—a willingness to forget, especially when specific ties to specific people are broken. State socialism also had its effects—the challenges of normal everyday life that made Poles reluctant to look to the past or the future, and the authoritarianism with which urban development was realized. This isn’t to say that Jewish memory wasn’t deliberately erased from the city landscape, but rather to put those practices into a broader context of erasure and rebuilding. The commemoration project was controversial. Months earlier, Pani Alicja at the Gmina Żydowska explained to me that they can’t reclaim land that has been built on. This would have ruled out most of the former cemetery land because it is under the Poznan Trade Center. The only alternative was in the courtyard, but some residents protested against putting it there. I asked Anka if residents had known beforehand that their homes overlook a cemetery. She said maybe, but they would have had other things on their minds. Also, many families moved into the area after the war ended so they would not have ever seen the cemetery. As we headed to a back gate to look at the other side of the cemetery wall, an elderly man approached on his way out from his apartment. He gladly unlocked the gate for us and paused to chat. He said he has only lived there since the 1970s, but his wife remembers playing in the empty field behind her apartment when she was a child (in what used to be the cemetery). She sometimes came across human bones sticking out of the sand. He said some residents didn’t like the idea of the memorial, but he had no objection. On the contrary, it was a neglected space before, with broken-down garages and lots of trash. He tries to tell people about the history of the place when they visit. However, there aren’t many visitors. The few who come are usually from abroad. He hasn’t witnessed any ceremonies occurring in the courtyard. This seems odd to me. Surely some heard the prayers and chants during the Kaddish in September, but I didn’t see a single person look out their window. 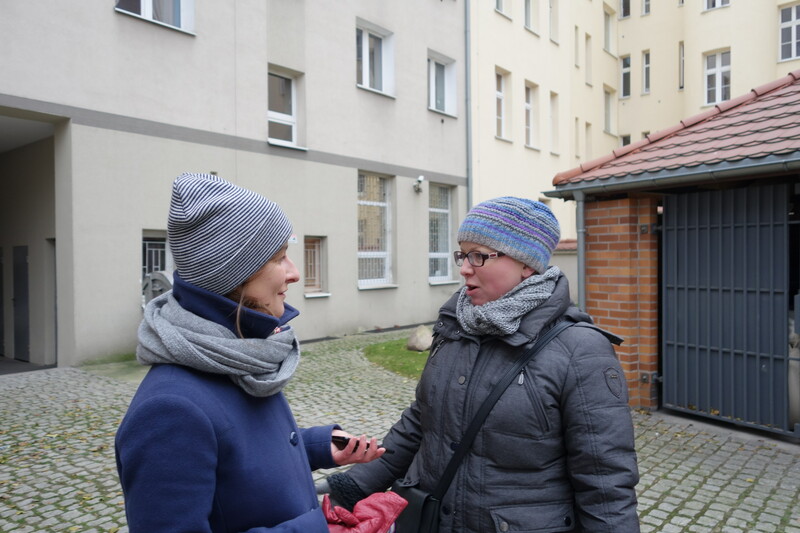 When asked Anka and Małgosia about this later, Anka defended the residents, saying only bathrooms and kitchens face the courtyard. Most people have no reason to look out those windows. The resident also told us about a large wooden cabinet adorned with three carved roses that his wife’s family found in their apartment when they reclaimed it (during the war, all Polish residents were forced out and Nazi officers lived there). Once, they had a visitor who asked if they had Jews in the family, explaining that the cabinet probably came from a prosperous Jewish family around Lviv. Perhaps a German officer liked it, claimed it, and brought it back to Poznan. The number of roses (one, three, or five) represents increasing status within the Jewish community. As we prepared to leave, Małgosia remarked that Jewish culture remains hidden in plain sight, even in places like this where the effort has been made to preserve it. Because of the locked gates, most people can’t come in.